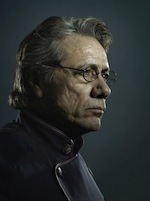 Kreg and I caught up with Edward James Olmos at Dragon*Con 2010. He was kind enough to give us an exclusive interview in exchange for a cup of coffee. The interview was early and we were a bit tired from the night before. Nevertheless, Edward hit it out of the park with this one. Find out what Edward did before he was an actor and how he achieved it. This is an amazing story about dedication and perseverance. This entry was posted on Monday, October 25th, 2010 at 6:00 am	and is filed under Shows. You can follow any responses to this entry through the RSS 2.0 feed. You can leave a response, or trackback from your own site.